Prior to service with NOAA, Commander Kunicki served as a commissioned officer with the United States Coast Guard as an engineering officer aboard the USCGC Storis in Kodiak, Alaska. In addition he served as Port Engineer at the Naval Engineering Support Unit in Honolulu, Hawaii and as a Military Outload Team member and Emergency Preparedness Liaison Officer for Coast Guard District Eight in New Orleans, Louisiana. After transferring to the NOAA Corps, CDR Kunicki completed three tours aboard NOAA fisheries survey vessels. 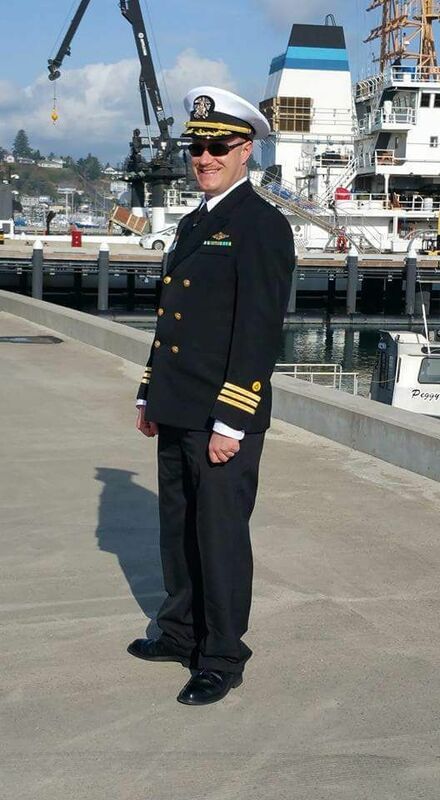 He served as Operations Officer on Oscar Dyson in Alaskan waters and as Executive Officer on Bell M. Shimada and as the Commanding Officer Bell M. Shimada. He has completed shore assignments in NOAA’s Right Whale Maritime Liaison Office and as staff officer in OMAO’s Fleet Standardization Office. Commander Kunicki has a Bachelor’s Degree in Physics from Idaho State University, a Master’s in Applied Mathematics, and a graduate certificate in Atmospheric and Oceanic Sciences from University of Colorado. He lives in Lake Forest Park with his wife Gemma, and son TJ. Daughter Keisha lives in Hillsboro, OR.